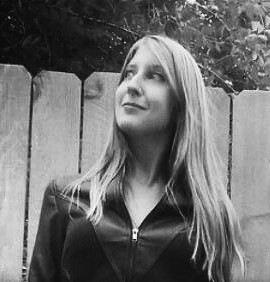 Catherine Kyle’s piece “Ode to a Parallel Universe in Which I Make My Point” appears in Midwestern Gothic‘s Winter 2017 issue, out now. My main connection is that I went to Western Michigan University for grad school. However, years before that, I made a long-distance friend (over AOL!) who lived in Michigan too. From the time I was 14, I’d go to see him every few years and we’d explore parts of the region—Chicago, Frankenmuth, Grand Rapids. It was pure coincidence that I ended up in Michigan for grad school. By that time, my friend didn’t even live in the state anymore. But when I moved to Kalamazoo, I already had fond memories of the Midwest. Between these two sets of experiences—recurring adolescent vacations and four years of grad school—Michigan took on something of a symbolic quality for me. It became a place where I could find my voice. My friend and I shared a lot of meaningful conversations and I think, especially since our culture tends to define teenage girlhood within a very narrow set of parameters, having that unstructured space to explore abstract ideas, to listen to someone else explore abstract ideas, and to be taken seriously as a thinker—it really taught me something. It opened me up to a version of myself that was defined by thoughts and emotions rather than hobbies and appearances. In short, my times spent there were steps on the path to a more introspective life. Being accepted to Western’s Ph.D. program helped affirm that connection. Michigan became the territory that gave me a chance as a writer, thinker, and teacher. So actually, I owe it a lot. I’d be remiss if I didn’t also mention the many creative individuals I met in the Midwest. In Kalamazoo, I met dozens of people who were deeply, profoundly devoted to literature. These people encouraged me, challenged me, inspired me, and helped shape my ideas about who I wanted to be as a writer. What comes immediately to mind is the landscape. I come from Washington State, where there are lots of different kinds of nature within close proximity—even from downtown Seattle, you can see snowcapped mountains, evergreen forests, and a large body of salt water. What struck me about the Midwest was its almost hypnotic amounts of grassland. Lots of my favorite memories of Michigan come from driving late at night with friends, staring out the passenger’s side window at rolling gold grasses and star-specked skies. Those stretches of plains are rhythmic in a way that lets your mind wander to unexpected places. I also did experience something of the hospitality for which the region is so famous. I’ve lived on the west coast and the east coast and in two countries outside the U.S., and nowhere but the Midwest did people come up to me in grocery stores and advise my shopping choices! That friendliness was very compelling. I think there is a part of me that will always be standing on Marina Beach, near where I grew up, staring out over Puget Sound. That place is indelibly burnt in my mind. It’s basically all my chapbook Flotsam is about. As far as the Midwest goes, the places that come to mind are more or less locations where I felt the desirable weight of other people’s expectations. By this I mean places where I doubted myself but someone else believed in me, and the desire to be accountable to them made me keep going in whatever I was trying to do. Waldo Library. Water Street Coffee. The Kalamazoo Amtrak station. Parked cars on snowy days. These were all places where someone else’s faith pushed me and ignited some kind of determination, which I think is important in writing. The first poems in the manuscript I’ve been working on, which is all about parallel universes, were inspired by dreams. For example, I had a dream about a parallel universe in which I have a daughter. In reality, I don’t have children and I don’t plan on having any. But the dream was so vivid and bittersweet that I had to write it out in order to come to terms with it. Working from a dream space freed me from the inclination to make things realistic, so the poems that followed are all imbued with surrealism, magical realism, and fairy tale logic. It’s been tremendous fun writing them. That said, another source of inspiration for this series has been fear. A friend once described a writing activity where you list the things you want to write about, then list the things you’re afraid to write about, then throw out the first list and move forward with the second. I kept that advice in mind as I wrote these. “The things you’re afraid to write about” has been a guiding theme. When I was really stuck last summer, I’d draw a Tarot card and write something based off of that. If you go this route, I’d advise finding a deck with art that really speaks to you. I used the cards’ color and imagery as much as their archetypal meanings when gleaning inspiration. I’m not a big reviser. I’ll spend hours on a piece trying to make sure it says what I want it to say the first time around. I do reluctantly revise days or weeks later if something is feeling significantly off upon repeated readings, but I’ve learned that in general, my best work comes from the gut. Everyone has their opinions and tastes when it comes to poetry. After a lot of reading, I’ve determined that I want three things from a poem: strong emotion, strong imagery, and shocking content. I don’t mean luridness for luridness’s sake. But I want a poem to startle me somehow, either through its use of language or the sentiment it expresses. We all look for different things in poetry. But this is what I want and what I aim to create. If a poem is lacking any of that, it’s probably not done. My longtime favorite fiction writer is Toni Morrison. She weaves beauty and horror together unlike any other writer I know. She stares into everything that makes our species terrible while also acknowledging our capacity for goodness in an understated, unsentimental way. There is no other writer who makes me shudder so much at what people are capable of—not just in extreme circumstances, but in everyday, unnecessary cruelties—but also believe there is something to be redeemed, that we shouldn’t just throw out the entire project of being human. She doesn’t offer hope in a placating way, though. Her writing continually makes me realize that it is up to us, in the day-to-day, to sway the world in a cruel or compassionate direction. We can’t just smile and say a few platitudes and assume everything will be all right. Our small decisions matter. I don’t have one favorite poet. Lately I read two books by Sharon Olds and Night Sky with Exit Wounds by Ocean Vuong and those absolutely blew me away. I love Olds’s frank treatment of sexuality. Vuong’s use of imagery—and again, that ability to confront human cruelty while also suggesting it’s not all that defines us—was just incredible. Right now I’m gearing up for a new semester of teaching literature and first-year writing. I’m teaching Persepolis for the first time in a few years, so I’m thrilled about that. Creatively, I’m brainstorming plans for this summer, which is my main writing season. I’d love to try a graphic novel or another poetry manuscript. My site is www.catherinebaileykyle.com. That has links to Facebook (in case you like gleeful status updates about student analyses of anime), Twitter (updated maybe twice a year, but I’m trying to be better), Instagram (in case you like pictures of cats, though I do post some creative writing stuff there), and Pinterest (in case you like pictures of more cats, though this has some creative writing stuff too). I’m really interested in how the latter two intersect with writing, since they’re primarily image-based. Add me on there so we can talk about image-hunting and things that can’t be photographed.